Today I want to write about a really cool whale, the humpback whale. These massive animals grow up to 15 metres long and weigh up to 30 tonnes. Their long pectoral fins are the longest in the animal kingdom, reaching 5 metres in length. The humpback whale gets its name from the way they curve their back before they go on a deep dive. Despite their size, they are able to leap out of the water, which is a spectacular sight. Humpback whales have the longest migrations of any mammal, swimming up to 25,000 km every year. They only feed in summer, before swimming to their breeding areas for the winter. They don’t eat at all in winter, surviving off their reserves of fat. Male humpback whales are well known for their songs. Each song goes for about 10-20 minutes, but they can be repeated for up to 24 hours. No-one really knows why they do this. Like blue whales, humpback whales are have baleen in their mouths, which they use to catch plankton and small fish like herrings and haddock. They have also been observed using bubbles to trap their prey so that they can come in and gulp down thousands of fish in one go. During the 20th century, humpback whales were almost driven to extinction, with 90% of their population killed. However, since whaling has stopped in 1966, their numbers have improved to about 80,000 and they are no longer considered in danger of extinction. 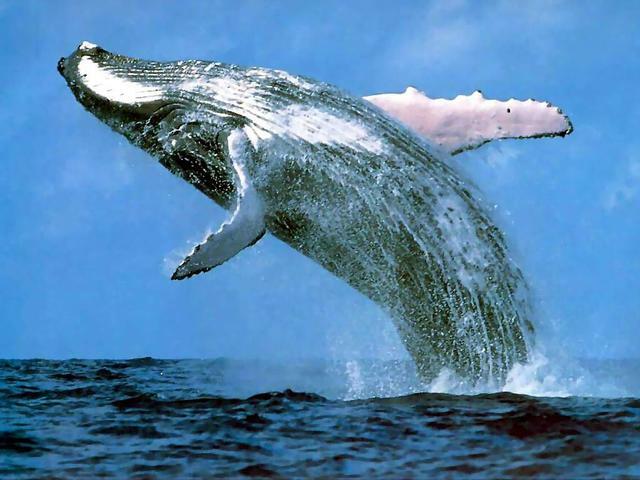 Are there any other interesting facts that you would like to share about humpback whales?